The 'First Anniversary of the Universal Seonghwa of Sun Myung Moon, the True Parent of Heaven, Earth and Humankind' was held on 7. 17 by the heavenly calendar, 1st Year of Cheon Il Guk (solar: August 23) from 10:00 am at Cheong Shim Peace World Center. 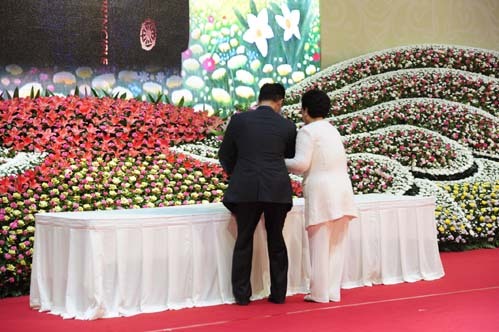 To attend this memorial ceremony, 25,000 members from around the world came to Cheong Shim Peace World Center and for members in 194 nations there was a live broadcast over the internet. The Part 1 of the Memorial Ceremony began with the welcoming address by the MC, Dr. Chang Shik Yang, Chairman of the Unification Movement in Korea. The program was; singing of the Cheon Il Guk Anthem, Opening Prayer, Offering of Flowers, True Father's Life and Work, Memorial Address, Memorial Poem, Presentation of the Cheon Il Guk Constitution and White Paper on Church Assets and ending with True Parents' speech. The opening prayer was offered by Archbishop George Augustus Stallings, Jr., Chair, ACLC which was then followed by offering of flowers by each representative of various fields. The MC also announced to the members attending that they could offer flowers after the event in front of the fountain of Cheong Shim Peace World Center outside. In his Memorial Address, Dr. Chul Seung Lee, Chairman, Seoul Peace Prize Cultural Foundation, said, 'Without a doubt we mustn't forget what Leader Sun Myung Moon had left us'. Then the Venerable Seong Ta, Head Monk of Bulguk Temple said, 'He lived his life for the salvation of humanity and to create a peaceful world' and that 'Words such as peace activist, idealist, educator and Messiah are inadequate to express Father Moon.' Then Hon. Jose De Venecia, Founding Chairman, International Conference of Asian Political Parties, Philippines, said, 'Let's all try to achieve the ideal peace world that Rev. Moon had tried to achieve'. Then Hey Seon Jeong, Actress and Ambassador for Peace read a moving poem with a title, 'Letter to my father'. Then it came to the Presentation of the Cheon Il Guk Constitution and White Paper on Church Assets. Rev. Young Hwi Kim, Rev. Jae Suk Lee, and Rev. Joon Ho Seuk presented the Cheon Il Guk Constitution and Peter Hyo Hyul Kim and Rev. No-hi Pak presented the White Paper on Church Assets. True Mother said, "On this beautiful day, True Father is within the hearts of the VIPs and blessed families from around the world. I sincerely pray that you become children, supporters and children of filial piety to heavenly parents and True Parents of Heaven, Earth and Humankind today". 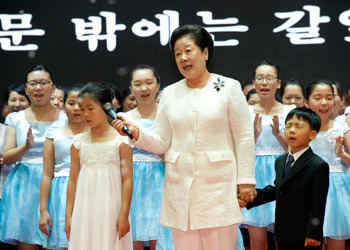 True Mother shedding tears to the Musical "Crown of Glory"
As for the Part 2 of the Memorial Ceremony there was a singing group by the 'True Grandchildren and Cheon Il Eum Chorus', solo by Gloria Del from Paraguay, Chorus by Sun-hak Choir, Japan, Musical Gala Show 'Crown of Glory, and three cheers of eog-mansei by Rev. Yong Cheon Song, Chairman of the Unification Movement in Japan. The True Grandchildren and the Cheon Il Eum Chorus sang 'Thinking of my brother', 'Chrysanthemum', and 'Edelweiss'. The Sun-hak Choir from Japan sang a original song called 'filial piety' in Korean and received great applause. 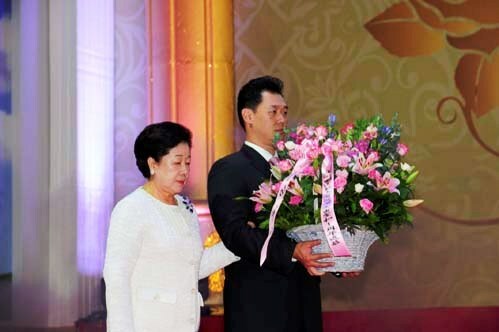 The high light of this memorial ceremony, the Musical 'Crown of Glory' Gala Show was a shorter version of True Parents' Life Course Musical performed at Cheong Shim Peace World Center Opening Ceremony on March 22, 2012. The actors and actresses reappeared once again on stage and performed a high level act. True Mother was watching with tears flowing from her eyes. After the final performance, True Mother came to the stage and sang songs that True Parents of Heaven, Earth and Humankind loved when he was still alive with the attending 25,000 people. As they were singing, True Father appeared in the large LED screen which made it seem that True Father was there singing with the members. At the end, all the blessed families offered a bow to True Parents and shouted, 'Thank you True Parents! We love you!' and ended the historical 'The First Anniversary of the Universal Seonghwa of Sun Myung Moon, the True Parent of Heaven, Earth and Humankind'.